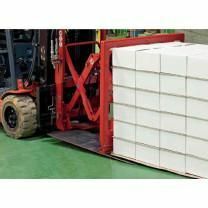 Anti Slip Sheets are flexible sheets of paper-like material which take on the shape of the bags or boxes that are stacked above and below the sheets. 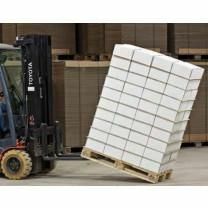 Anti Slip Sheets increase the coefficient of friction between layers and provide better interlocking characteristics between stacked items to prevent the items from shifting and sliding. 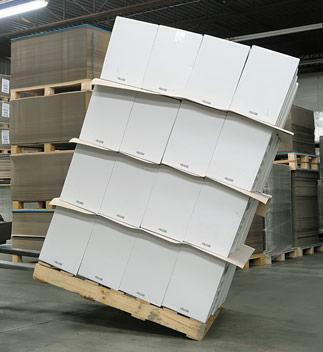 Moving a stack of items that has not been stretchwrapped or otherwise secured can be risky in that the load can tip or slip during a quick turn or even an abrupt stop. A fallen load results in wasted time at best and damaged products or personnel at worst. Insert layers of Anti Slip Sheets between your items as you stack your load to have a greater sense of security, ease, and safety when transporting your stacked items. All of the Anti Slip Sheet materials are recyclable, reusable and repulpable.